The witching hour at our house is without a doubt between 5pm and 6pm. I am still working on dinner and everyone is just starting to get a little bit restless and hungry. My husband comes home just after 6pm and most every night, we all eat together as soon as he comes through the door. Frequently, I make fresh fruit and veggies as a side to go with our dinner and on the particularly restless days I serve that to the children earlier. 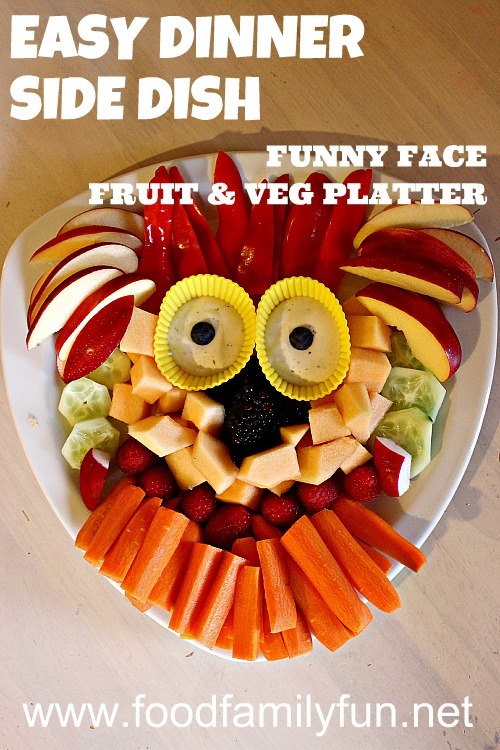 Here are a couple of funny face fresh fruit & veggie platters. There were no fancy techniches as you can see. Everything was peeled or cut very simply and just arranged to make a funny face. On this day I used red apples, red pepper, cucumber, cantaloupe, blackberries, strawberries, carrots, radishes and two mini cups of ranch dip with a blueberry in each. Everything was devoured! Even the blueberries which I was expecting to be cast aside as blueberries in ranch didn't sound that yummy to me! 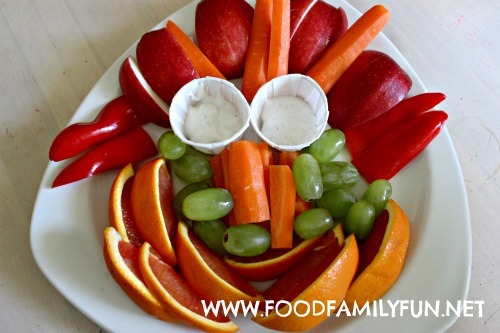 Another night I made this funny face fruit & vegetable platter. I used some similar ingredients, red pepper, sliced apples, carrots, green grapes and an orange. I believe this was a blood orange but the colour wasn't as dark as they usually are. Arranging the platters in this way, takes hardly any extra time and adds a bit of fun to the meal. 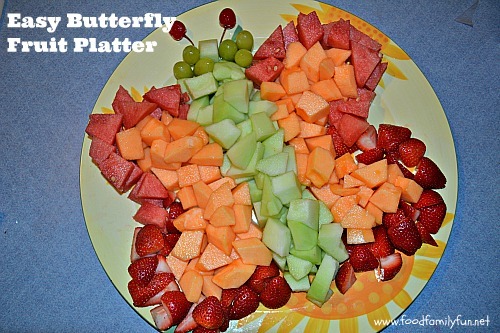 Another great time to make fun fruit and vegetable platters is for birthday parties; like this easy butterfly fruit platter for a Cute Bugs Party. I used cut watermelon, cantaloupe, honeydew melon, strawberries,green grapes and a couple or maraschino cherries to make it. A mini version is also great for an afterschool snack. For an afterschool snack I often add a few crackers and cubes of cheese. It makes a really fun playdate snack too.